Waiting shapes the narratives of individuals and societies alike. Yet, waiting is more than just one realization of the present. Far from being a mere form of intermittent white noise, waiting could be conceptualized as the unravelling of and the reflection on a plurality of possible futures. Waiting simultaneously foregrounds the often paradoxical agency/passivity of the waiting subject as explored, for example, in the narrative of Penelope in Homer’s Odyssey. As Harold Schweizer observes: “Waiting is as resistant to description and analysis as time or boredom. Although central to the idea of narrative from Homer to Hollywood, waiting is a temporal region hardly mapped and badly documented.” This interdisciplinary conference explores and conceptualizes how “waiting” shapes the narratives of individuals and societies alike and in what shapes and forms these narratives manifest themselves. 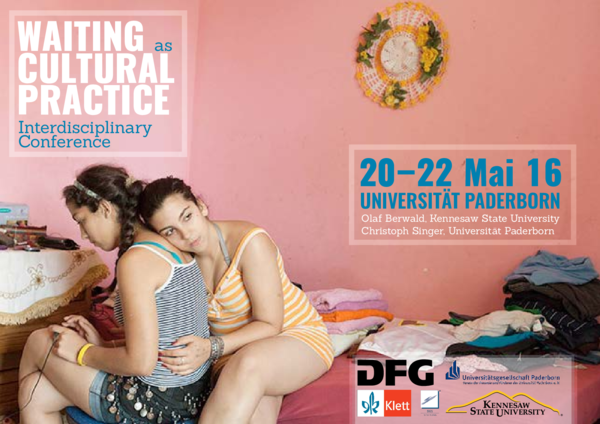 Firstly this conference focuses not only on the influence of “waiting” on individual and social narratives, but also on how these are being narrated. The representation of waiting has produced some of the most remarkable narratives, often connected to themes such as return, redemption or revenge. How is waiting represented in different cultural artefacts? How can the simultaneity of possible futures be packaged as superficially linear forms of mediation? What is the cognitive impact of real or fictional waiting? Do “waiting narratives” show a propensity for the allegorical? Secondly, how is waiting a relevant part of cultural rituals in contexts of intimacy and public spheres (e.g. courting, mourning)? How is waiting related to the experience of mobility and immobility, e.g. in the case of refugees, who are detained in camps for months? How does the continuous endurance of “chronic waiting”  e.g. in the case of unemployed youth in southern Europe, affect and shape whole societies? 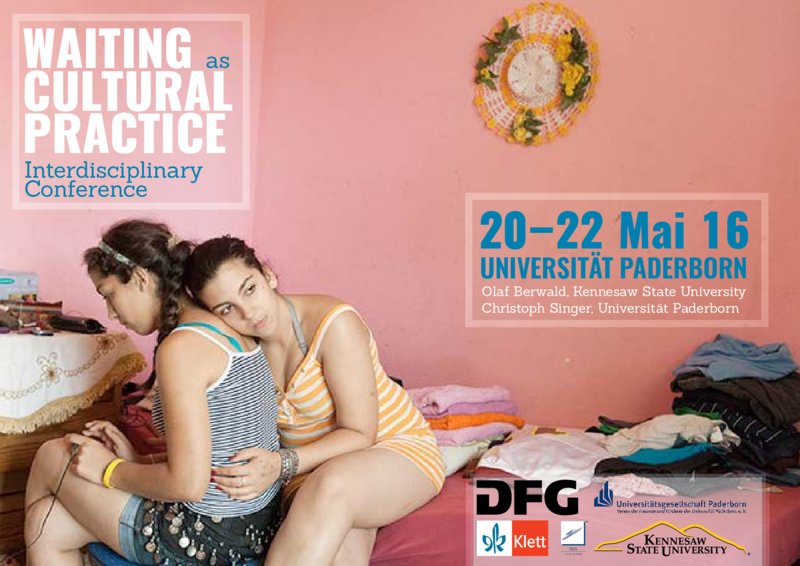 Thirdly, this conference aims to discuss the spatiality of waiting. How do spaces such as waiting rooms or bus stops shape the waiting subject’s thought processes? How are these spaces representative of the power conditions that construct them? Is the resulting creation of “abstract futures” and the “forthcoming” (Bourdieu) intentional and in what instances of "timepass" do they result? Schweizer, Harold. On Waiting. Routledge: Abingdon, 2008. 1. Jeffrey, Craig. Timepass: Youth, Class, and the Politics of Waiting in India. Stanford: Stanford University Press: 2010. Art Show "Waiting Rooms of History"
Line 68 to Schöne Aussicht. Busses will take about 15 minutes from the city centre to the university. By foot: If you prefer to walk from the city centre to the university you should make it in ca. 25 minutes. By air: Paderborn has a small airport, 20km outside of town, which can be reached by bus or taxi. Close international airports are Hanover (2 hours by train), Düsseldorf (2 hours by train) and Frankfurt (3,5 hours by train). By train: Paderborn is easy to reach with local trains (RE) or Inter-City-Express (ICE). Here you can find an updated list of hotels. The prices already apply to university guests. With exception of the Bed and Breakfast we made reservations at all of these. The reservations will be held until March, 15th. So please make sure to book beforehand. With exception of the Campus Lounge, which is right next to the conference venue, all other hotels are located at the city center. The university and the city center are connected by public transport (ca. 10 minutes by bus). The walking distance is about 25 minutes.